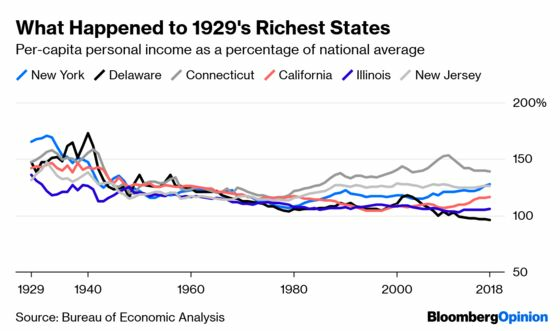 (Bloomberg Opinion) -- In 1929, the six richest states in the U.S. were, in descending order, New York, Delaware, Connecticut, California, Illinois and New Jersey. Four of those are still in the top six (Illinois missed the cut by a few places, while Delaware has fallen to 22nd; Maryland and Massachusetts replaced them). 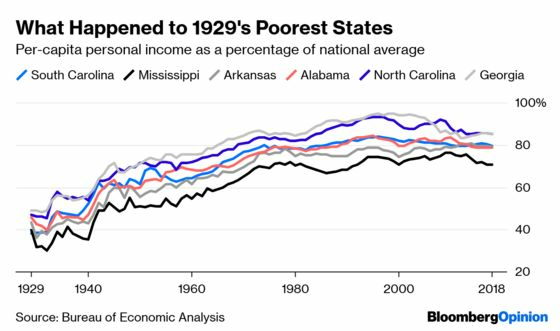 The six poorest states in 1929 were, starting at the bottom, South Carolina, Mississippi, Arkansas, Alabama, North Carolina and Georgia. Mississippi, Arkansas and Alabama are still in the bottom six. South Carolina (only barely; it’s now seventh-poorest), North Carolina and Georgia have escaped, to be replaced by West Virginia, New Mexico and Kentucky. Per-capita personal income is admittedly not the most closely watched of economic indicators. In the short term, it can give some pretty strange results: West Virginia had the fastest-growing per-capita income of all the states in 2018, according to preliminary data released late last month by the Commerce Department’s Bureau of Economic Analysis, but that was partly because its population shrank by an estimated 11,216. Per-capita income also doesn’t tell us anything about the distribution of income. The Census Bureau’s median household income estimates do that, but those come with big margins of error and are only readily available back to the mid-1980s. 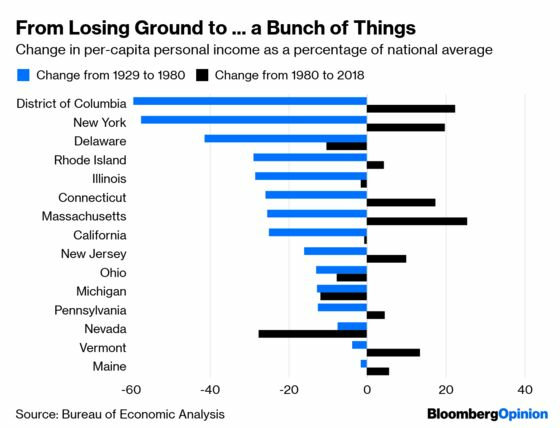 Which leaves per-capita personal income as a quite useful measure of the changing fortunes over time of American states and localities (it’s available down to the county level). A handful of cities with the “right” industries and a solid base of human capital keep attracting good employers and offering high wages, while those at the other extreme, cities with the “wrong” industries and a limited human capital base, are stuck with dead-end jobs and low average wages. While in the past Americans have often moved from struggling areas to boomtowns, thus evening out such regional wage disparities, this has gotten harder in recent decades because of “tight land use regulations in wealthy areas” that drive up housing costs, Peter Ganong and Daniel Shoag wrote in 2016. State-to-state moves were less than half as common in 2018, as a share of U.S. population, as they were in the 1940s through 1970s. Those with the least education are least likely to move, partly because of those high housing costs, but also, as new research from David Autor has revealed, because the wage premium for moving to a more densely populated area, while still high for those with college educations, has declined a lot for those with high school degrees or less. Amid those big-picture trends, though, the charts above do hint at some smaller, more state-specific stories. 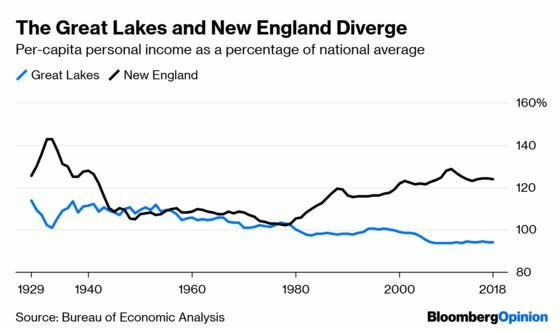 There’s the recent decline in Connecticut’s fortunes apparent in the top chart, which I wrote about a few weeks ago. There’s formerly rich Delaware’s long and seemingly unabating decline, which seems like something I ought to write about. 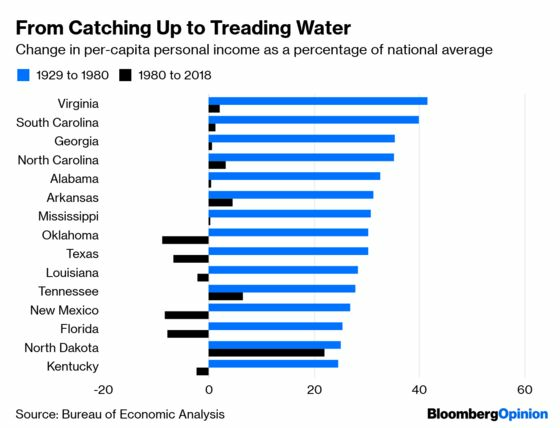 There’s the case of formerly poor Georgia and North Carolina, which came so close in the 1990s to breaking into the ranks of richer-than-average states, then fell back. North Dakota is the real standout here, and while some of its recent gains have been related to the shale oil boom of the past decade, its oil-poor neighbor South Dakota has followed a similar trajectory. And while their 1929-1980 income increases were accompanied by zero population growth in South Dakota and actual decline in North Dakota, since 1980 the Dakotas have gained population, albeit at a slower pace than the country as a whole — indicating that something about their combination of solid educational systems and business-friendly policies (and perhaps weather that keeps all too many people from migrating there to take advantage of them) really does work. Oil-rich Oklahoma, Texas and Louisiana, meanwhile, still suffer from comparisons with the boom times of 1980. And Texas and Florida, which together accounted for 26 percent of U.S. population growth from 1980 through 2018, have found that it can be hard to outpace the rest of the country in per-capita income growth when the capita keeps rising so quickly. Florida, though, actually did catch up with the national average per-capita income in the early 1970s and stayed about even with it amid lots of population growth until 2006, only to lose ground amidst the housing bust that it has yet to regain. The District of Columbia has been through the most spectacular turnaround, which won’t be a surprise to anyone who’s been to the nation’s capital lately, although it should be noted that even in the tough times of the 1970s and 1980s, its per-capita income was still well above the national average (in 2018, it was $81,882, or 152.4 percent of the national average, compared with $74,561, or 138.8 percent, for the richest state, Connecticut). 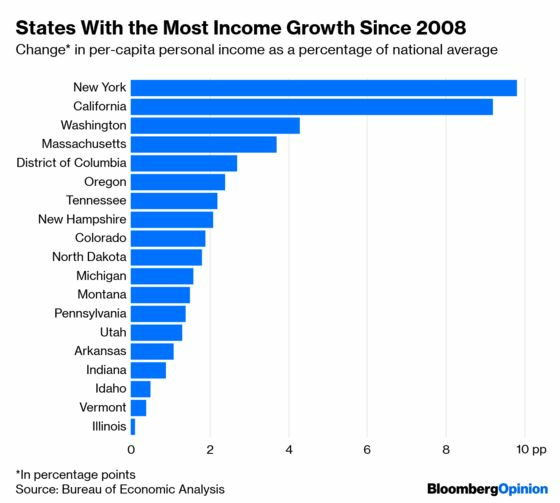 This is a mix of states bouncing back from a really terrible 2000s (Michigan most of all, but also Colorado and Indiana), a state gaining in per-capita income as its population shrinks (Illinois), and states that are genuinely booming (Washington, Massachusetts, Oregon and others). What really stands out, though, are leaders California and New York, two wealthy states with superstar cities and not enough new housing construction that more or less epitomize the big-picture economic trends of income divergence, land-use constraints and reduced mobility. In case you were wondering, I chose to look at the top six states because six is how many lines Bloomberg's charting app can comfortably accommodate.